I read Heart of Darkness at a great time. I’ve been wanting to reread it as I’ve mentioned before, but also I just finished Barbara Kingsolver’s The Poisonwood Bible which centers around Belgian Congo. Though the events in the book happen over sixty years after the events in Heart of Darkness, Ms. Kingsolver borrows heavily from the themes of racism and cultural arrogance centered around the Congo. Also, just this week I went to watch my husband teach his World History class at the University and he actually mentioned Heart of Darkness! What a good time to have read this book! To situate the book, it is important to know that once natural resources and minerals were discovered in Africa in the late 19th century, European countries began to lay claim to large parts of the continent. The biggest contenders were France and England, and the other countries, like Portugal began to worry that they wouldn’t be able to get what parts they wanted. So, the Berlin Conference was formed where Africa was sliced up and handed out fairly. (Well, as long as you weren’t African at least, it was fair) The Congo was a bit of a different case since it wasn’t given out to a country, it was given to a person. King Leopold of Belgium now owned the Congo and chose to rule by company administration. The company he formed began to use the native population to amass a gigantic fortune for Leopold mainly in rubber. The outstanding exploitation and cruel abuse of the Congolese has been widely documented, but it actually grew so bad that even other European nations began to exert pressure on Leopold to lighten up or to give up the Congo. Leopold ends up relinquishing control to the government of Belgium. I’m not saying things got wildly better for the Congolese, but you know you’re a bad imperialist when even the other imperialists think you’ve gone too far. During this time Joseph Conrad was employed by a Belgian trading company to take a steamship up the Congo River. Like other Europeans at the time Conrad was disgusted when he actually came into contact with the abuse of the Congolese people and wrote this book denouncing the effects of Imperialism. (I should point out here that while the River is named, the Congo itself is not actually named. But we all know what he's talking about) While later authors have criticized Conrad for not going far enough, we have to remember that Conrad was a product of his time. He was Polish born and always considered himself Polish, but by the time he entered the Congo and definitely by the time this book was written he had been given British nationality and had certainly settled in England. So, it’s not quite like the British people were going to denounce Imperialism any time soon. As for the book itself, I didn’t really think of it like an extended poem. (I’ll have to ask my sister to explain that one to me) Though Conrad certainly did have a powerful grasp on the art of writing and some of the way he phrased things bordered on poetic. (Seriously, how does one come up with a gaze falling on one “as trenchant and heavy as an axe” ) The plot is basically what I just said about Joseph Conrad, only replace Conrad’s name with Charles Marlow. Marlow is recounting to some fellow shipmates about the time he was employed by a Belgian trading company to take a boat up the Congo River, and along the way became disenchanted with Imperialism and its effects. Heart of Darkness is uses Mr. Kurz as an example of failed imperialism. 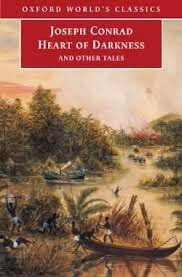 We are told Mr. Kurz is going into the heart of darkness bringing science and progress and pity (probably meant more as a patronizing pity and not mercy as I originally thought), but at the end of Marlow’s tale we are left questioning whether the heart of darkness is the Congo or Mr. Kurz’s own heart. Now, there are some unanswered questions here. Is Conrad saying that cultural arrogance, ill-treatment of the natives, and the push into Africa is at fault for the eventual break-down of Mr. Kurz or is Africa itself at fault for pulling him in? Or are both things working together against Mr. Kurz’s efforts? I’m not sure the answer is obvious, but I do think there is a clear criticism of whether Imperialism was good for either side. There is a part about halfway through when Marlow and his crew are moving up the river toward Kurz when he observes the native population and begins to question his superiority to them. I thought this was a very well done scene since he was beginning to recognize the humanity (imago Dei…though he probably didn’t know it) in the people around him. Being made in the image of God is something that belongs to everyone, regardless of color and creed, and even regardless of whether you acknowledge God at all! But it’s a very radical concept, especially in an age where white superiority was being heavily emphasized for the purpose of acquiring more land and power. Reading this today seems tame, but I’m sure when Conrad was writing, this type of thinking would have been scandalous. So, I love being in a “classics only” bookclub, but I also find it particularly challenging to know what to say that hasn’t already been said about these classic works. 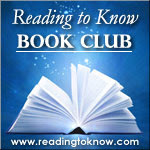 There are much smarter people than me reviewing this book, so really all I can talk about is my own personal reaction. I think the book was amazing. It’s tough to say that since there is a lot of darkness (heh) in it, but I think it was well written and I think Mr. Kurz is such an immense character. You can clearly see that Conrad is a great writer. I can’t say I had fun reading the book. Sometimes I got to the end of the page and had no idea what I just read so I had to go back. Also, there was a little nautical terminology and I have never done well reading nautical terminology. I tend to space out a little and you just cannot space out when reading Conrad. You have to focus, and it took some energy. Now, this review has gone on entirely too long, but grant me this one last indulgent confession: This book (at least my copy) was under 200 pages and I could NOT seem to get started. I finished it yesterday and I had the whole month, and I only finished it because I actually forced myself to just sit still and do it by brewing a cup of tea and not allowing myself to move. Tea is the great motivator. Ok, so I (Carrie) confess that I didn't finish reading it because I could not get into it and I didn't understand it. However, hearing the background history of it makes me want to push through to the end. I make no promises, but after reading Heather's explanation and thoughts, I'm really curious. Thanks, Heather, for taking the time to write that all up. I think a long review of this one is actually most helpful! Did anyone read it? Now is the time to share your own thoughts! We're curious to hear them. Did not even make that connection with Valentine's Day. That is hilarious! I took a few pages in and that was about all I could do. My brain just wasn't into it this month! Pick me, pick me! I read it! I did! I've read this several times and can't say that I've ever been a huge fan - but, as usual, reading with the knowledge that I'd have to talk (or at least write something) about it caused me to think about it (and enjoy it) more. I chose not to read it either, having only had a brush with it in high school that left me wanting nothing to do with it, but Heather's review and explanation and setting it in its times does open it up more for me. I wonder how many high school experiences with certain books "inoculated" us against them? I wonder if that's due to how they were taught or our immaturity at the time. At any rate, though I still don't think I'll read this any time soon, I appreciate knowing more about it now. Love the thought that Marlow/Conrad began seeing began to see the humanity and image of God in the natives even though he probably didn't recognize it as such. I did finish it (just last night!). The book reached far into the depths of my brain. Although I can't say I actually understand all the underlying messages, it definitely was an interesting read. I really appreciate Heather's reaction and further description of the book. I'll have to put this on my wish list. It seems appropriate now, to me, because the 50th anniversary of Bloody Sunday and the March from Selma to Montgomery for voting rights are being commemorated here, where I live! And the atrocities of the Civil Rights struggle seems connected to the atrocities of previous centuries in Africa and to Africans.